A couple years back, I picked up a really nice Montecristi hat. It fit wonderfully and looked sharp. Well, it used to look sharp. From what I deem was a combination of not being properly blocked before it came into my possession, coupled with my having worn it while working a few outdoor cigar events in some humid and inclement weather, it is one Ecuadorian that has seen sharper days. This wear and tear is pretty apparent in this picture – the crown is in decent shape, but the brim has lost all structure. 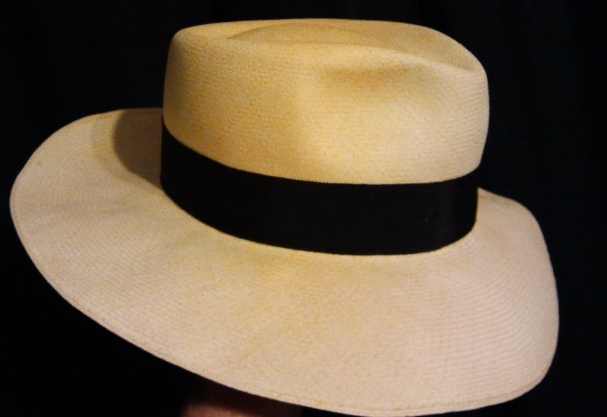 I’m far from an expert in Montecristi hats, which are often somewhat generically called Panama hats. I am however a tremendous enthusiast of them because of their craftsmanship. The Montecristi name is derived from the town of Montecristi, Ecuador, where these amazing works of art are crafted by true artisans. The Panama name is basically derived from the hats traditionally being shipped overland from Ecuador to Panama, form which point they could be shipped to points east via the Caribbean, or west via the Pacific. Teddy Roosevelt also took to wearing one of these hats when he was down inspecting the construction of the Panama Canal. T.R. was a venerable brand ambassador. His later successor, Harry Truman, also frequently donned a classy Panama, particularly during the time he spent in Key West. Back to my road weary straw hat. It’s time for some T.L.C. It is being shipped off to Optimo in Chicago. Optimo is an old school hat shop because they rightly believe that the old way is actually the high tech way. My Hat Service Form is all filled out and ready to go. I’m to get a call in a week or so to let me know that my hat needs to restore it to its full potential. Stay tuned for the next installment.